Forensic anthropology has been plagued by questions of scientific validity and rigor despite its acceptance as a section in the American Academy of Forensic Sciences nearly half a century ago. Critics have viewed it as a laboratory-based applied subfield of biological anthropology, and characterised it as emphasising methodology over theory. This book shows that these views are not only antiquated, but inadequate and inaccurate. 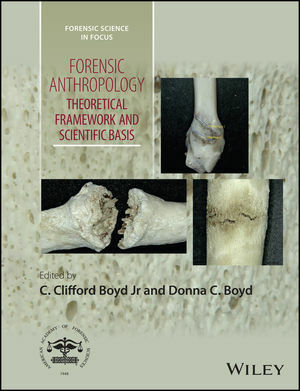 Forensic Anthropology: Theoretical Framework and Scientific Basis introduces readers to all of the theoretical and scientific foundations of forensic anthropology — beginning with how it was influenced by the early theoretical approaches of Tyler, Morgan, Spencer and Darwin. It instructs on how modern forensic science relies on an interdisciplinary approach — with research being conducted in the fields of archaeology, physics, geology and other disciplines. This modern approach to theory in forensic anthropology is presented through the introduction and discussion of Foundational, Interpretive and Methodological theories. Sections cover: Bias and Objectivity in Forensic Anthropology Theory and Practice; The Theory and Science Behind Biological Profile and Personal Identification; Scientific Foundation for Interpretations of Antemortem, Perimortem, and Postmortem Processes; and Interdisciplinary Influences, Legal Ramifications and Future Directions. Forensic Anthropology: Theoretical Framework and Scientific Basis is ideal for university courses in anthropological science, forensic science, criminal science and forensic archaeology. C. Clifford Boyd Jr, PhD, RPA, is currently a Professor of Anthropological Sciences at Radford University, Virginia, Co-Director of the RU Forensic Science Institute, and Consultant for the Virginia Office of the Chief Medical Examiner.